As soon as I read the title and the book description, I was intrigued. I love learning historical facts about different cultures and this story brings us a picture of what life was like, especially for women, in the mountain tribes of Albania at the turn of the 20th century. 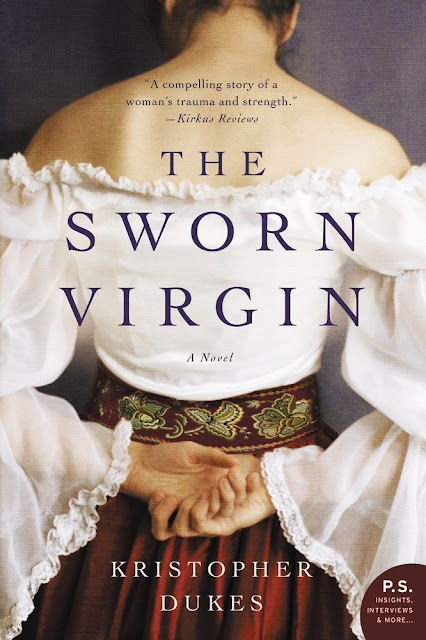 Dukes’s gripping historical novel tells the tale of a desperate Albanian woman who will do whatever it takes to keep her independence and seize control of her future…even if it means swearing to remain a virgin for her entire life. This book was fascinating because of the subject. Women could take the oath of being "sworn virgins" and in essence take on the role and respect given to men, but would need to remain a virgin for the rest of their lives. I have to say that Dukes really made this little known history come alive. The traditions, blood feuds, and daily life of the Albanian mountain people felt strange and so removed from modern day that it almost felt like I was reading about life in the middle ages rather than 1910. Eleanora is a very complex character. She starts out as a pampered and beloved daughter who must now survive with her stepmother after her father is killed. To avoid marriage to a cruel man, she takes on the oath of a sworn virgin but soon after falls in love. It felt more like infatuation and obsession at some points in the novel, but nonetheless, this relationship she develops with Cheremi is also complicated because of both their pasts. Much of the story then focuses on how they will make this relationship work. I went through so many emotions reading this book, which is a testament to the author's writing. While at times I admired Eleanora, at other times I wanted to shake her. Eleanora was educated and she was also an artist. I'm glad she made the decision she did at the end of the story, although it was not easy. I felt the ending was good. This book was different and for that I am glad. If you love historical fiction with a strong woman character in the lead, then this one is sure to please. To read more reviews, please visit Kristopher Dukes' page on TLC Book Tours. Hadn't heard of it before - sounds like a good read! A strong female lead is definitely a good reason to read a book! I'm glad you enjoyed this one! I enjoy reading historical romance but have never come across such oath. Seems intereesting. I'm glad you enjoyed it. This book sounds absolutely fascinating. I definitely want to read it!